General Taylor flask - is it a repro? Hi everyone. I was looking for some help with a "General Taylor Never surrenders" bottle. 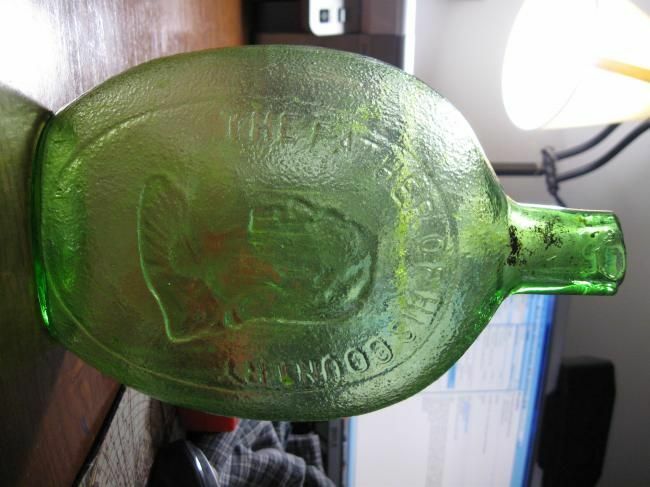 I am in NJ near the old Clevenger works, so I guess it could be a repro, but a local bottle guy was not sure and said I should ask some experts! Can anyone help? Note that in the picture of the neck the top looks like it has a chip out of it. This is not a chip, it is smooth. Thanks in advance! After looking at the Washington Taylor Flask page it seems to me that perhaps the orange peel effect means mine is a Clevenger. Any help would be appreciated! thanks! Thanks for the info. I am not a bottle guy either, and the more I research the more confused I get- though it has been fun! I will try and get a better picture of the pontil scar and post it later today. No CB anywhere on it. It looks close to pictures I have found of other Clevenger reproductions, but is different enough to confuse me! Living so close to the old Clevenger Works I just am assuming it came from them. I have a box of other old bottles I found in the attic of the house we just purchased, I will post some of them in a different thread in time. In the meantime, anymore help with this one would be great! It just doesn't seem to fit exactly any description of the Clevenger reproductions I can find. 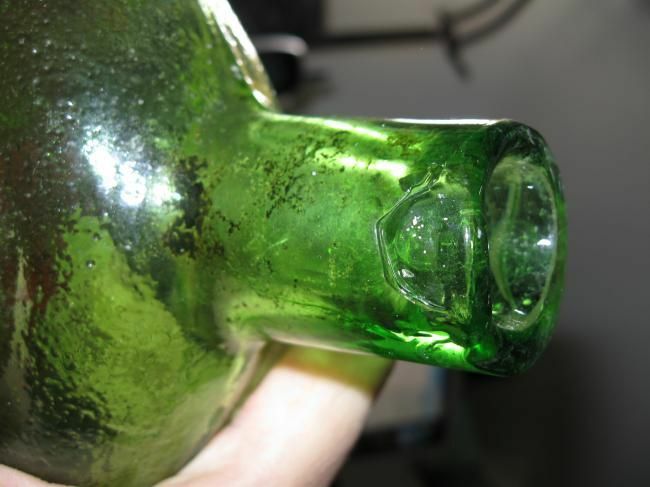 another pic of the bottom of the bottle. Anyone else have any thoughts?! The bottle is modern and could very well be Clevenger. 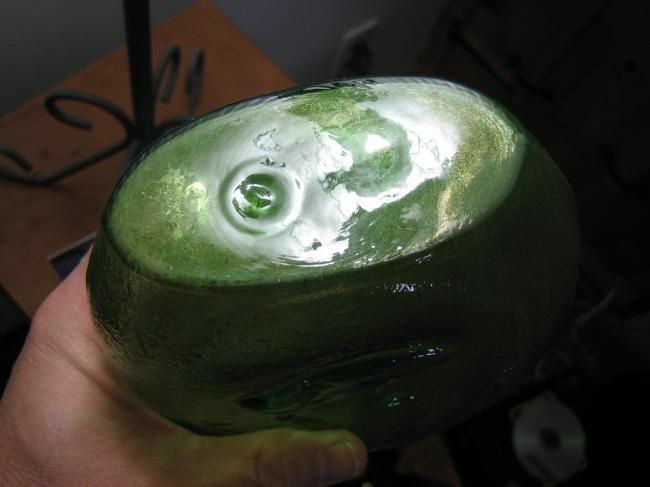 The orange peel texture to the glass can be found on 19th century bottles but is unusual, and one does see it on Clevenger glass. Probably only Tom Haunton could say for sure if he has seen one like this from known Clevenger stock, but reasonably safe to assume so. 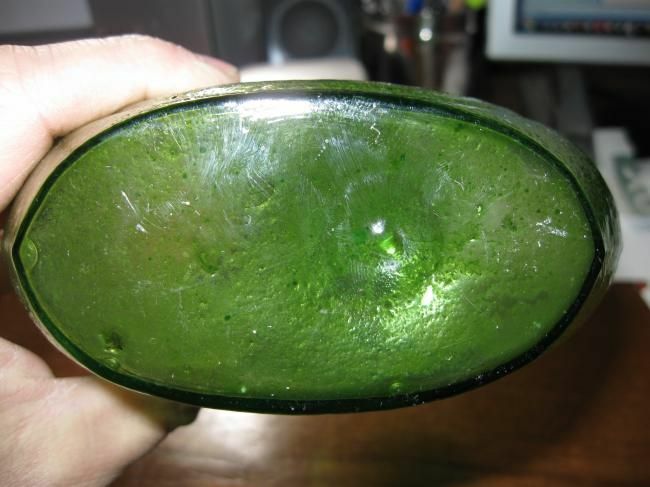 The glass is too heavy for most all 19th century historical flasks, that color is found on 19th c. glass but would be scarce for sure in a flask, and the only flask bases that I have seen like that have a mold seam across the long axis. Chris, thanks so much for taking the time to reply. Just curious, is that a fake pontil scar? Since I am not a collector I was thinking of selling the bottles I found- is it even worth it? Or is there no worth here? And if I sell it do I call it a Clevenger bottle? And is ebay as good as any a place to sell if it's worth it? Maybe I will just start collecting! Sorry for all the questions! Thanks! is great - even without professional cleaning. It reveals a protective nature probably resulting from a leather type covering. I kept it in a case with many other lesser bottles until a visitor who was a bottle person saw it and said it woukld be wise to protect it! I need to post picture so others can enjoy! Yes, we would love to see photos. Sounds like an incredible flask. Sometimes bottles do come out of the ground in incredible condition - soil moisture and possibly pH have some role as well.